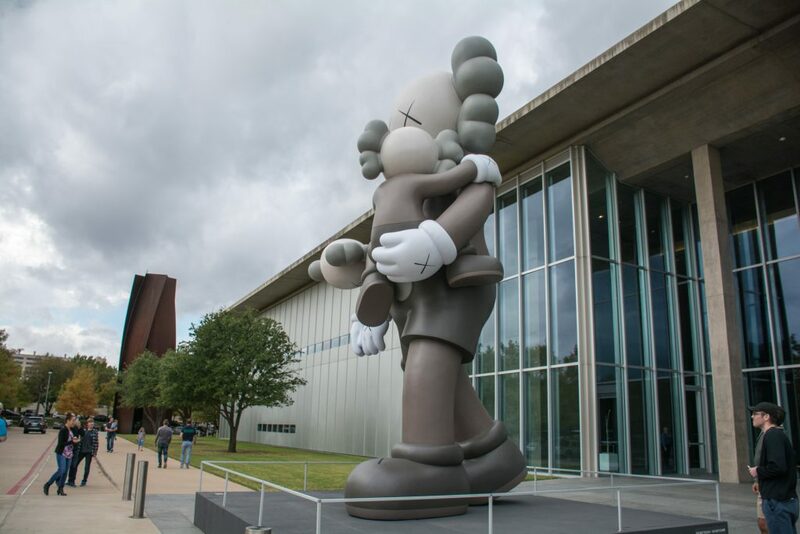 Fort Worth – Three versions of the same image start a large exhibit of 2- and 3- dimensional work by KAWS at the Modern Art Museum of Fort Worth. Six different colors make three different combinations that test our emotional reactions – if we take the time to respond to each one – one at a time. We feel differences: different strengths, different intensities, different vibrations. 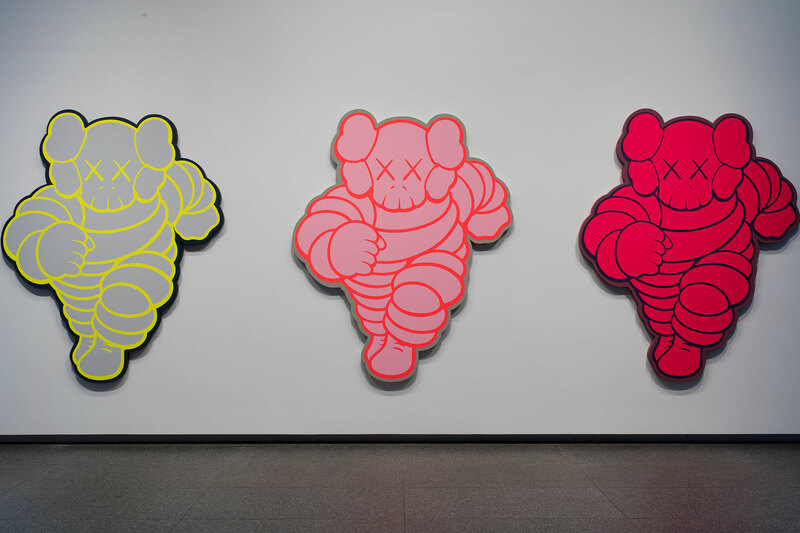 These three figures are just one in the visual vocabulary of KAWS – an artist that sounds like a group of some kind. 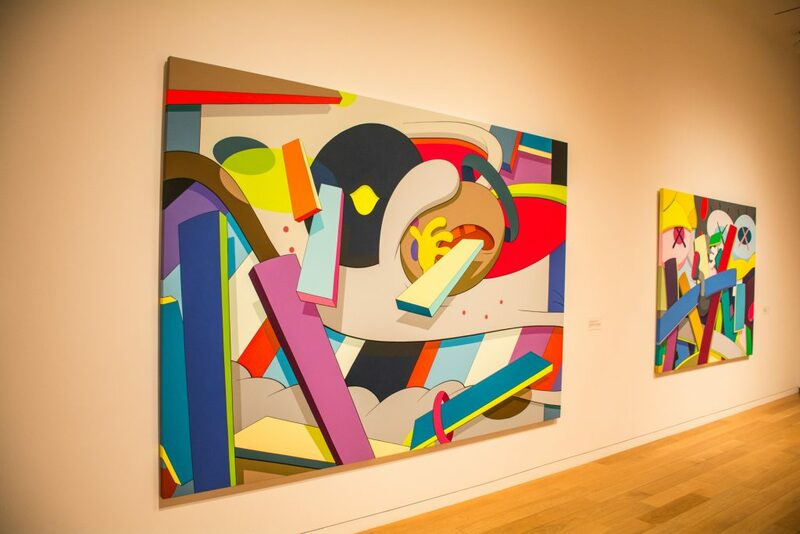 However, KAWS is one living American artist from New Jersey, who started out doing graffiti. Repetition with slight variation is a common way poets point out differences and subtleties, and I like that we are given a lesson in subtlety from the get go. While the gray/yellow combination feels more angelic, the black and red is dominant and dramatic. Continue through this show and watch the intensity ramp up. 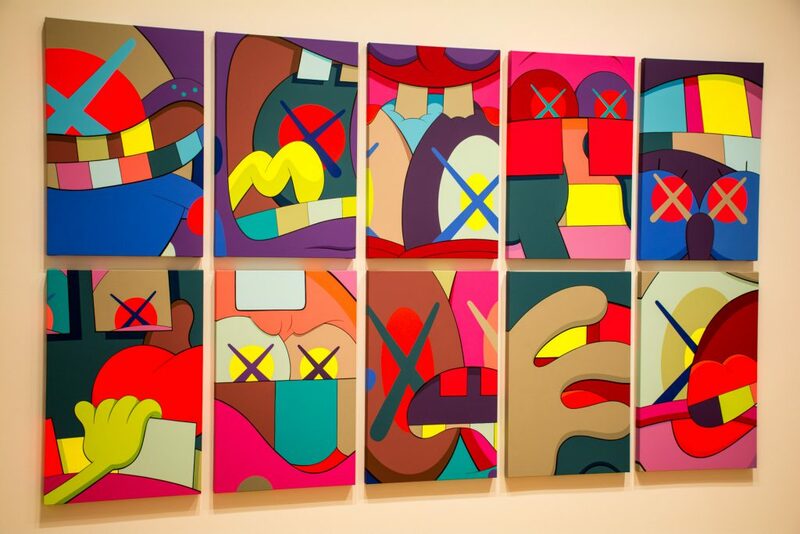 KAWS repeats images constantly from his lexicon – a deceptively small one, like the percentage of the English language we use in current conversation. His images are taken straight from the visual conversation of our time. Repeated, they stick with us. Images get associated with a meaning just as words do. Much as we might be aware of visual advertising and think we can be immune to its lure, repetition often defeats us, and we recognize a brand without wanting to know it. Repetition gives it a power, as it gets stuck in our neural net. 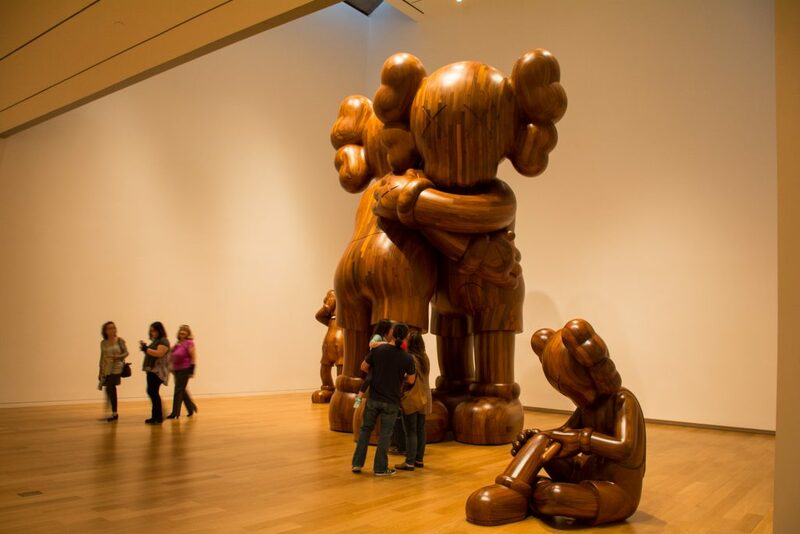 KAWS uses this power to tell stories. 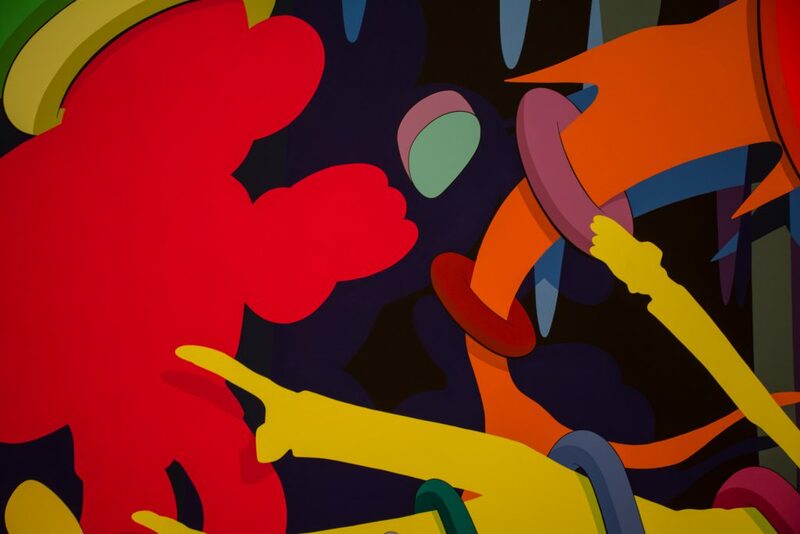 The first trio of images introduces us to the most recognizable symbol in KAWS alphabet, the X that is a stand-in for an eye. These X’s are drawn as two diagonal strokes very precisely made to resemble a hand-made stroke. The lower half of each stroke is a little fatter with pigment making the bottom seem closer to us and implying that the eyes are rolled up – starring out and up. Not the reverse, which would feel heavy-lidded and visually tell us the figure is looking down, or more inward, pensive. 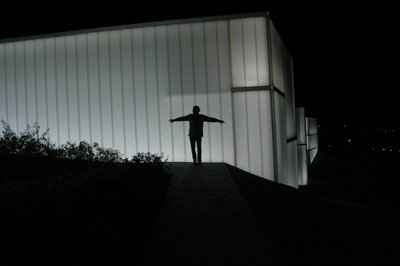 This up-and-out-gazing X doesn’t imply openness or receptivity, but the opposite. A looking that is possible right at us but not exactly able to see. 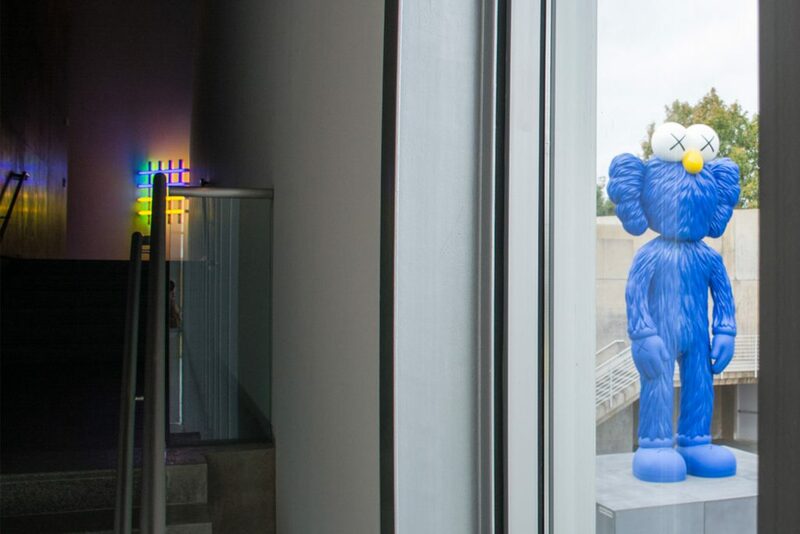 More of KAWS’ visual icons appear in the second gallery space. 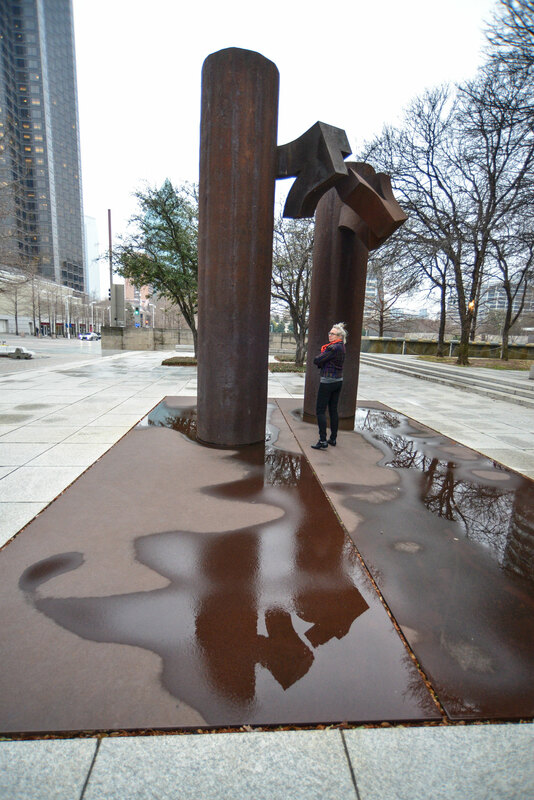 This round room centers on a tall sculpture of two figures: a very shiny black Gumby and another figure with a tail for a body. The head of this figure is large and spherical. It has those eyes, too. Its body coils around Gumby in a very familiar way. There is not a single hard edge on its body – not even the Flintstone-style hair ornaments (?cross-bone earmuffs?) where ears would be. Comic not ominous, we are lead to believe this embrace is sensuous or familiar. Gumby isn’t damaged or vulnerable to the body of this sperm-shaped figure; it is embraced. Gumby is only an expanded cut out. 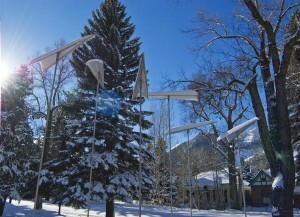 It is the sperm-figure that makes this sculpture full round. But Gumby’s stance – jaunty as a navy sailor in all black – makes it happy. I’m sure there is much more story that could be imagined about these two. 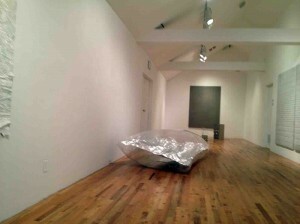 In the following gallery, the paintings are less narrative. Shapes seem to leap out from the thick canvas they were laid upon. 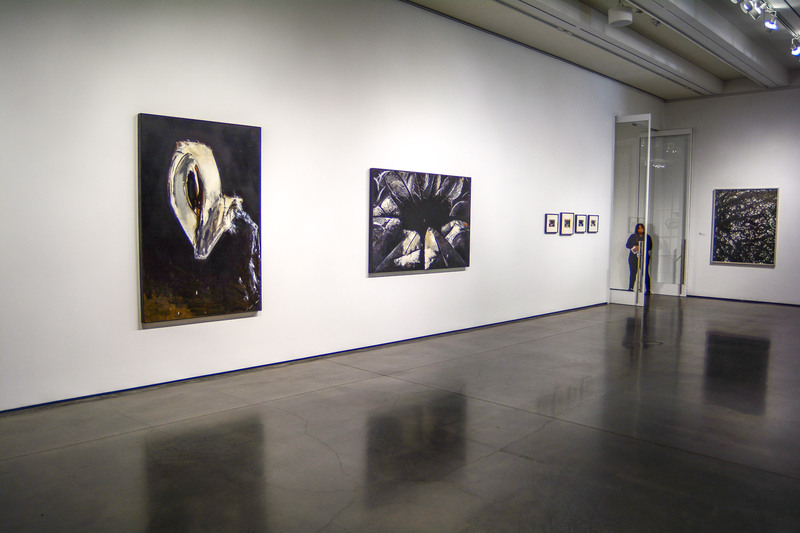 I want to touch the surface to figure out why, and get close enough to realize the paintings are one slick flat surface with deftly painted shadows – a slightly darker version of the color they are on – an old realist’s trick. The shadows have more impact, my companion said, because the painting is on a thick, smooth board and casts a soft firm shadow similar to that in the cartoon paintings. Everything about the style reminds us of cartoons: the subject matter – boards, hands and explicitly Snoopy, the Simpsons, Smurfs. Cartoony, too, are the colors, the hard edges, the very definite (not sketchy) drawing style and the drawn outlines filled in with color. 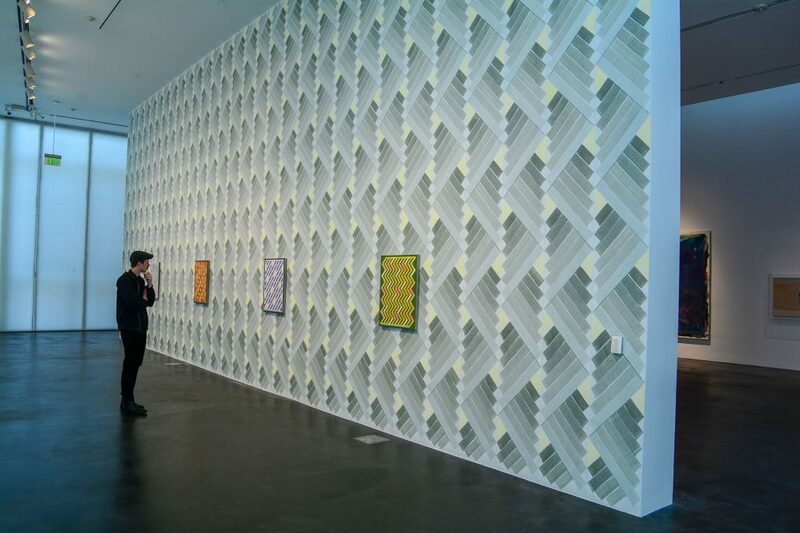 In the round gallery with Gumby, the wall is hung at eye level with round canvases all the same diameter. Their circumferences seem to circle certain details from a wider world of KAWSy drawings. We can pick out references to figures with the X X eyes, to Mickey-Mousey hands and more entries in the KAWS dictionary. These round paintings could be prints. The style is impeccably clean and show very little of the marks from the making. The details are different, but the shape, size and colors are the same. After this, I’m not sure how much the repetition is doing for me. I have learned the symbols and now what? 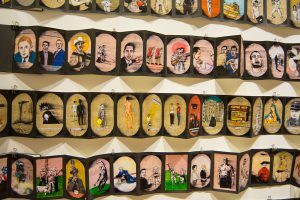 Visitors were very impressed by the next, very large gallery, where full figures of the mickey-mouse vernacular are presented on a huge scale. These are figures we know from the repetition here and elsewhere (you’ve seen this artist before, I’m sure, if only subliminally). Note what he’s chosen for grandification – not the sperm snake/ghost figure. 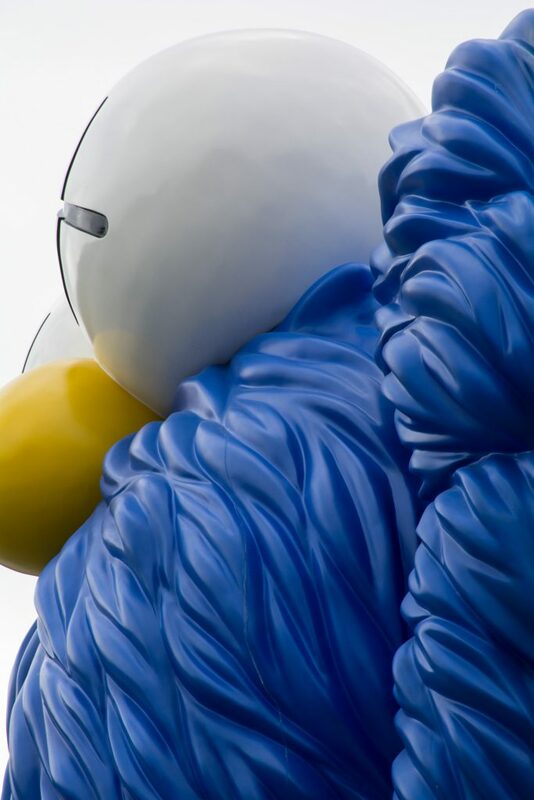 The artist has mass produced his style by making toys and setting up brandrf shops in Japan. 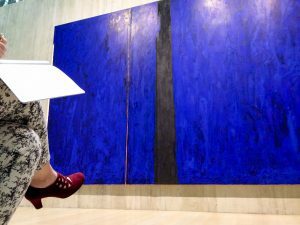 I admire his ability to make a living as an artist and to have the cache to afford the technology to make them huge and precise and in nice warm, expensive materials like wood and bronze. Another guest said, the wood figures are amazing; she couldn’t image how he was able to do them. Money was my answer and technology. 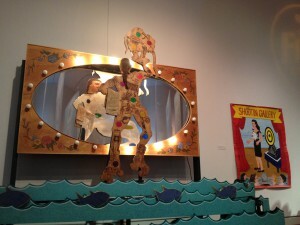 He didn’t carve these 10-foot figures by hard. Or, he fooled me if he did. These are not human figures carved by a human hand but by a machine designed to repeat. 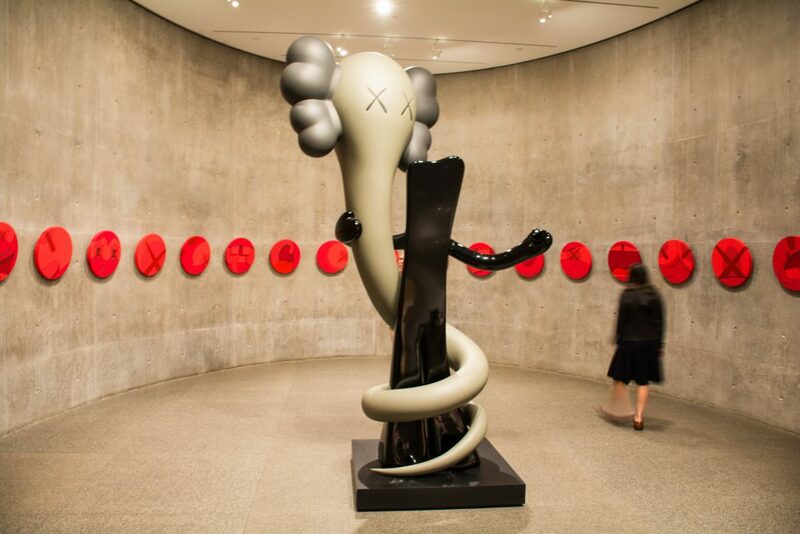 KAWS is an artist who recreates human traits so that we can contrast the actual to the perfect reproduction of the mucked up cartoon character – the X-ed out sight, the insensitive balloon hands, the bulging or drooping middle, the shiny cranium and the skinny legs that plague bipeds in general. 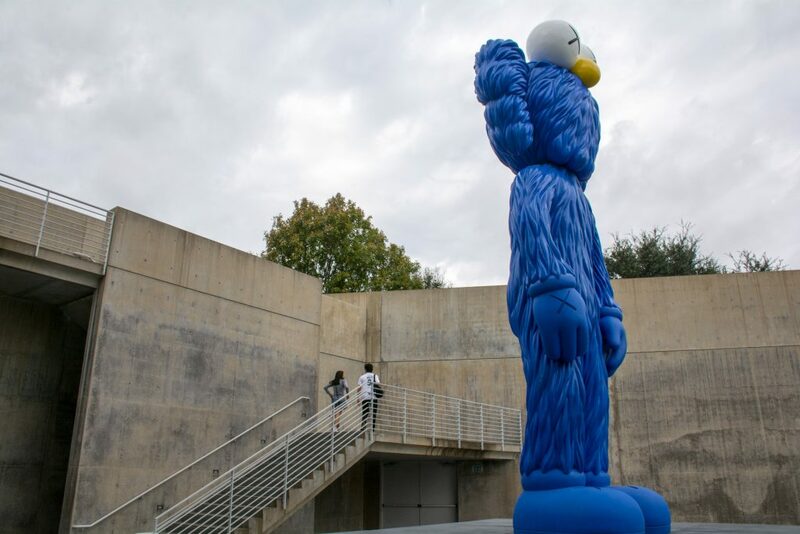 More big sculptures show up outside: the bugs bunny knock off, the michelin-man, and a large blue muppet-y one. KAWS’ dedication to craftsmanship in handling the materials and technology puts the emphasis on the story, not the artist. It is a pleasure to not be distracted by sloppiness. There’s plenty here to see before our eyes turn into Xs.